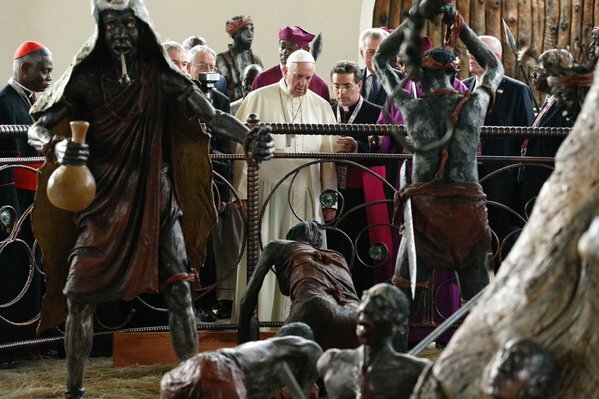 Pope Francis has strongly condemned corruption and tribalism in neighboring Kenya. In his address to thousands of Youth at Kasarani stadium in Nairobi on Friday, Pope Francis said that corruption leads to inequality, adding that corrupt people do not live in peace. “Corruption takes away our joy, corruption takes away our peace, and corrupt people don’t live in peace,” stated the Holy Father who was speaking off cuff in his native Spanish, to youths, a government delegation led by President Uhuru Kenyatta and members of the clergy who attended the ceremony. “Corruption is not a path to life, it’s a path to death” he said. The Pope asked the youths of Kenya to fight tribalism and spearhead the fight against corruption. He told the crowd that the fight against the tendencies of tribalism and divisions is a daily endeavour that everyone should be ready to deal with. He asked the youths to uphold and defend family values as he led them in holding hands against corruption. The Pope expressed concern that not only kids are abandoned but the elderly are also abandoned with nobody to visit them. “Be understanding with others. If you did not receive love, love others. If you were abandoned, come close to those who are lonely. Flesh cures by flesh” he said. The Holy Father noted that education and job opportunities are the solutions to radicalism. “If a young man and woman has no work and cannot study, then what future awaits him?” he wondered. He asked the youths to pray to the Lord to help them overcome all difficulties. Following his visit to Kenya, Pope Francis arrived in Uganda later that evening on his tour of three African countries. He was received at Entebbe International Airport by President Yoweri Museveni, first Lady Janet Museveni, Catholic Bishops and Bishops from the Anglican Church. Prime Minister Dr Ruhakana Rugunda, Speaker of Parliament Rebecca Kadag, Chief Justice Bart Katureebe, Minister for Security Mary Karooro Okurut were among thousands of Ugandans who turned up at the airport to receive the Pontiff. His Jet Alitalia AZ 4000 landed at Entebbe International airport with the Black, Yellow, Red Ugandan flag and the Yellow and White Vatican flags flying outside windows of the cockpit. It was a moment of joy, singing, chanting and dancing as the Pope was ushered into the country, greeting some members of the clergy and dignitaries who had lined up at the airport to receive him. 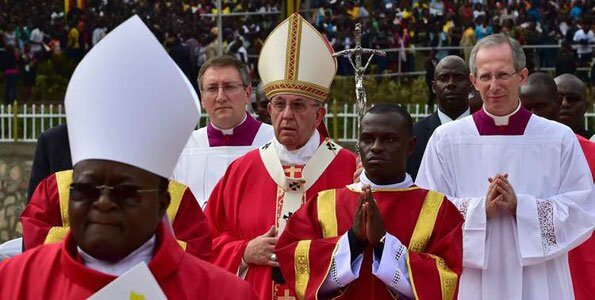 Uganda now holds the record of hosting three different Popes, Pope Paul VI, Pope John Paul II and now Pope Francis. Upon his arrival from Nairobi Kenya, Pope Francis was treated to an official state welcome with a twenty one gun salute. 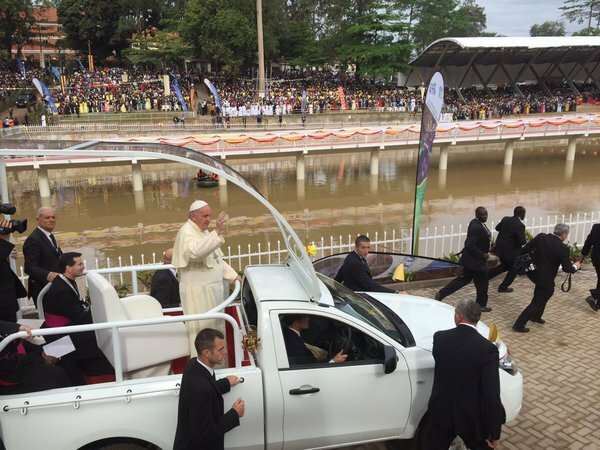 Pope Francis lead a Holy Mass on Saturday at Namungongo Catholic Martyrs shrine where thousands of pilgrims turned up. He also later met youths at Kololo Independence grounds and Bishops and members of the clergy at Rubaga Cathedral in Kampala. Pope Francis praised Uganda for hosting refugees fleeing fighting from their respective countries. Addressing dignitaries at State House, in the Lake side town of Entebbe, Pope Francis said Uganda has welcomed refugees giving them a chance to rebuild their lives. “In East Africa, Uganda has shown outstanding concern for welcoming refugees, enabling them to rebuild their lives” the Pope said. He decried the wars, violence and injustices that the world is witnessing that have greatly contributed to the influx of refugees. “Our World caught up in wars, violence and forms of injustices, is witnessing an unprecedented movement of people. How we deal with them is a test of our humanity, our respect for human dignity and above all our solidarity with our brothers and sisters in need” the Pope told cheering dignitaries. The Pope said Uganda was blessed by God with abundant natural resources that should be well managed. The Holy Father, who was speaking in English, told dignitaries hosted by Uganda’s President Yoweri Museveni, that the World was looking to Africa as the continent of hope. 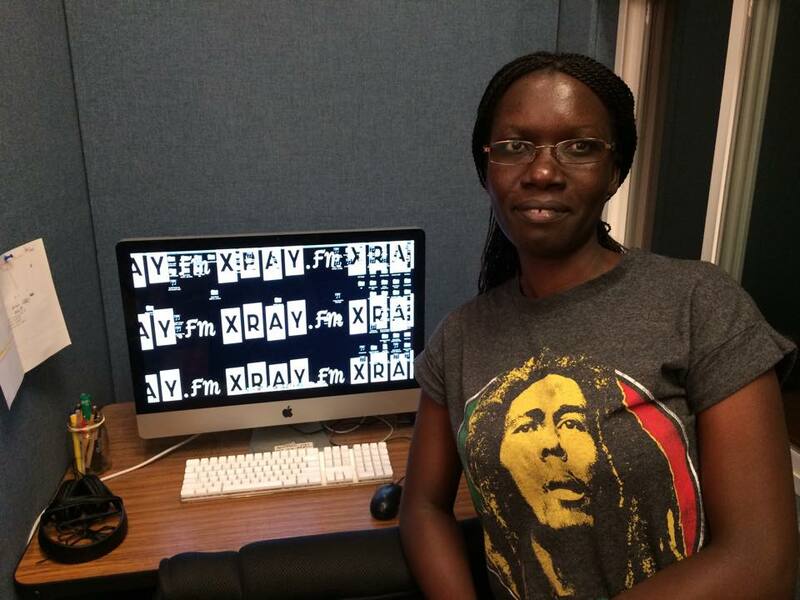 Pope Francis said it is important to educate the youth and be given opportunity of gainful employment to enable them to enjoy a brighter future. The Pope left on Sunday for the final stage of his three country African visit to the Central African Republic.